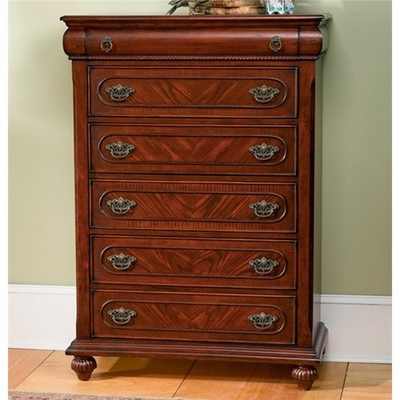 Accentuate your master bedroom with the charming and functional designs of this drawer chest. A top felt lined drawer offers a place to organize your jewelry collection with the additional five drawers for clothing storage. Carved details in the turned bun feet, rope trim, and unique hardware with an antique appeal create a beautiful storage piece for your bedroom.